Jose Martinez (1B - STL) The legend of Jose Martinez continued to grow Thursday as he went 4 for 5 with a home run and six RBI in the Cards rout of the Reds 13-4. Martinez is slashing .364/.442/.614 with three home runs and 14 RBI thus far in 2018. When looking at his peripherals, there are many that stand out. His 8.7% K% is WAY down from his 2017 mark of 19.5%. While his wRC+ sits at 141, with a .378 wOBA, his hard contact sits at just 25%. Martinez is proving to be the biggest bargain of the 2018 draft season, and while a slow down can be expected, enjoy the production and the multi-positional eligibility. Francisco Cervelli (C - PIT) The light hitting catcher hit his second home run of 2018 as the Pirates bested the Cubs 6 to 1 Thursday. Cervelli added a triple and 3 RBI on the day, and is putting up some nice counting stats to this point. Thursday's performance puts his slash line at .250/.348/.500 as he has provided a decent average and OBP, but not much else over the course of his career. He is most useful in two catcher formats as a guy who will not hurt you, but will not provide much in the way of power and RBI. If you own him, it is a nice change of pace to get some solid stats from the veteran, but don't count on it lasting. Kyle Schwarber (OF - CHC) The Cubs' slugger went 3 for 4 and provided the only offense in their 6 to 1 loss to the Pirates Thursday. Schwarber belted his third home run of 2018, and his day at the plate upped his line to .270/.357/.595. Heading into Thursday, his peripherals were very similar to what he has done over the course of his career. K% at 31.6%, BB rate at 13.2%, .331 wOBA and a hard contact rate in the upper 30s. Schwarber headed into draft season far down on a lot of boards, but remains a solid power source if you're able to build a roster around him that can withstand his low average and OBP. However, if he can up his BABIP a bit, and drop some of those batted balls in for hits, he could prove to outplay his preseason ADP. D.J. LeMahieu (2B - COL) The Rockies' second baseman provided the majority of the firepower in the Rockies' 5 to 1 win over the Nats Thursday. The 29 year old went 4 for 5 with two home runs, four RBI and two runs scored. LeMahieu has gotten off to a fast start with a .351/.422/.649 with four home runs,(halfway to his total of eight in 2017), eight RBI and eight runs scored. 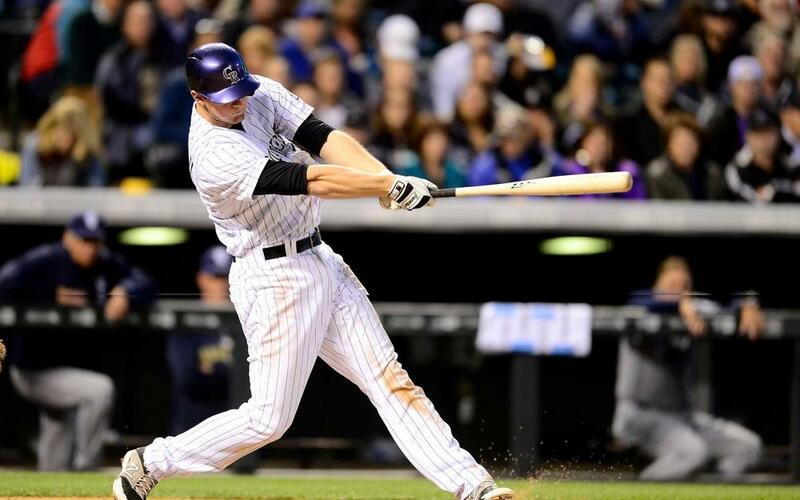 While the power surge will likely slow soon, LeMahieu is a sure bet to post a .300 average, an OBP over .350, while providing some runs and he plays his home games at Coors Field. He remains a solid option in a few categories that often are forgotten about in drafts. Tanner Roark (SP - WSH) Roark provides a bit of salary relief on DraftKings at $8700 as he faces a Rockies team that while talented, is also fourth in the league with 122 strikeouts. This matches well with Roark's 11.25 K/9 to begin the season, as well as his 11.9% SwStr. He is also backed by a lineup that contains the likes of Bryce Harper, Trea Turner, and Anthony Rendon. He is a nice value in order to add some higher priced bats in a large slate Friday.